Data Hookups Abound: Data Studio provides the ability to access data from over 90 connectors, and it seems like they’re adding more every day. 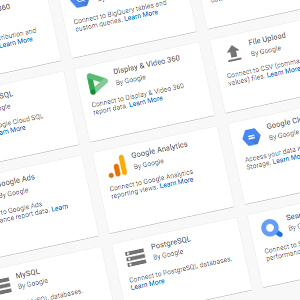 Our digital team’s favorite connectors are other Google tools like Analytics, AdWords, Search Console, and Google Sheets, which can be used to display completely customized data in Data Studio. In addition, with a little extra effort and budget, you can even set up Supermetrics or OWOX to pull in data from Facebook/Instagram Ads or other ad platforms. Kill Your PowerPoint: You can fully flesh out reports in Data Studio by adding images, such as screen shots of creative assets, and text boxes that you can fill with insights. This has always been a drawback of Google Analytics on its own, which doesn’t really have a good way to add commentary to reports. In the past, this issue forced us to create monthly reporting slide decks using PowerPoint, Google Slides, etc. and then add static screen shots of data visualizations along with our written insights. With Data Studio, those days are over. Try It Yourself: You can test drive Google Data by visiting https://datastudio.google.com/overview or by browsing the Report Gallery at https://datastudio.google.com/gallery. At Vermilion, we’re developing an ever-growing library of client-specific Data Studio reports, so shoot us an email if you’re looking for something specific. 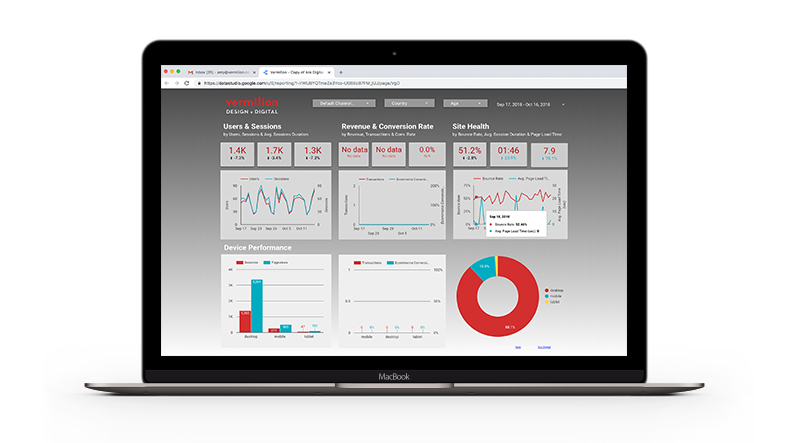 We may not be able to share an exact client report, but chances are we’ll have a template or two that could be a great starting point for us to help you create your own fully-customized performance dashboard. It’s not as cool as having a superpower, but if you love data as much as we do, it’s pretty close.